The word Gmail comes from “G-mail” in which G stands for Google here and mail is just the incredible mail service. Gmail is one of the very commonly used mail services nowadays. It is one of the best product by Google. It provides free email service, with some amazing features and functionalities. These makes it worth standing in the 1st place on this internet market. And being associated with Google makes it more trustable. Gmail used for every purpose includes general and business purpose. Gmail provides more than enough space on its free plan which can be used for a general purpose very well. If you need this mail service for business purpose then you can use one of its paid plans. On that paid plan you will be assigned a pretty decent amount of storage with improvement on other features as well. If you do use Gmail for the regular purpose, more than once a day then sometimes you may be feeling bored to see the same old/default background of Gmail. So, to make your work more interactive with Gmail than before, you need to change the background of your Gmail. 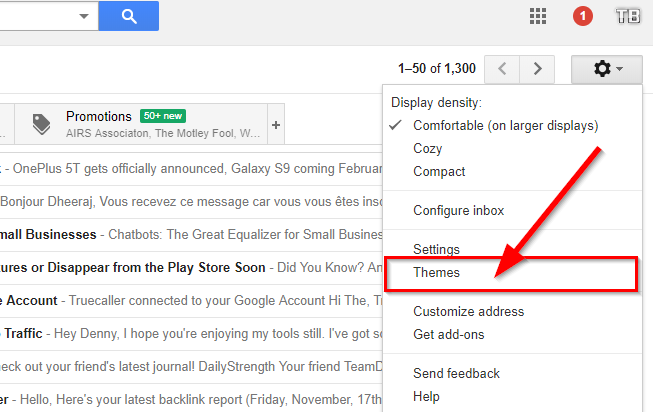 Changing the Gmail Background means, changing your theme. Changing Gmail background or theme is not a tough task, it’s just simple as changing the theme on chrome. Open Gmail App on the web and login to your Gmail account. Click on the gear icon from the top right corner, right below the user logo. After clicking on the gear icon, A number of options will appear from in the list. Click on Themes. Now on the popup window, you will see a number of themes to choose. Click any of them you want and hit save. It will instantly change your theme and there you will get a brand new background. Gmail also allows you to customize the backgrounds and you can make changes on the current background such as adjusting the level of blurriness in the background, make the corners darker, set the background of texts. All these options you can find beside that save button. 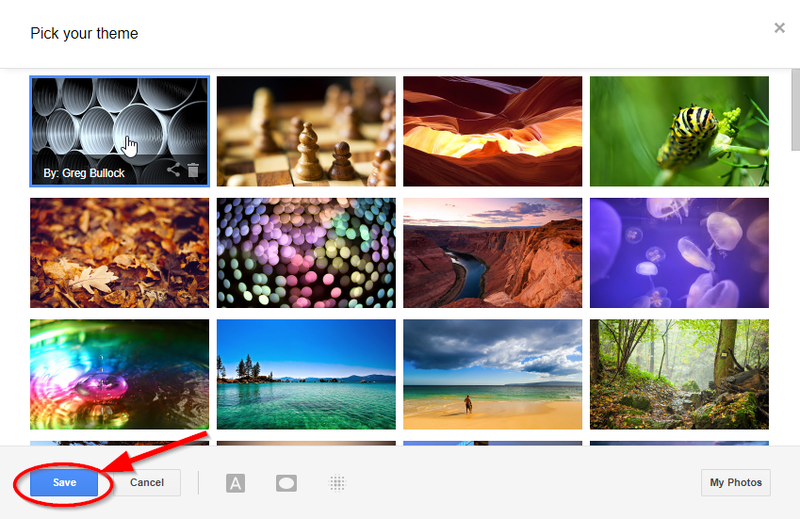 Click the gear icon and choose the Themes option as given in above image. It will take you to the theme window, from there choose the My photos option from the lower left corner. On the next window go to Upload a Photo section and choose image from your computer that you wanted to set in your Gmail background or simply drag and drop the image over the upload panel. 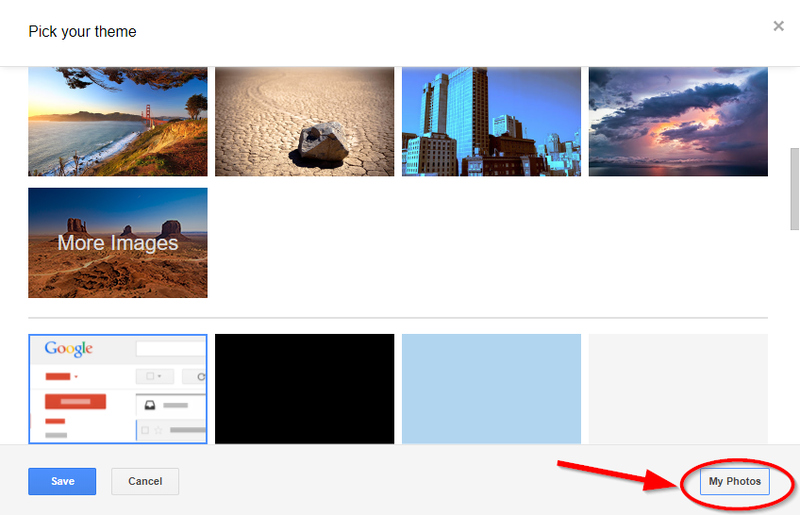 Once the image is uploaded, it will automatically come up in the theme windows, from where you can select the image and hit the save button to make changes and set that image as your background on Gmail account. You can see how easy it is, to change Gmail background or themes. 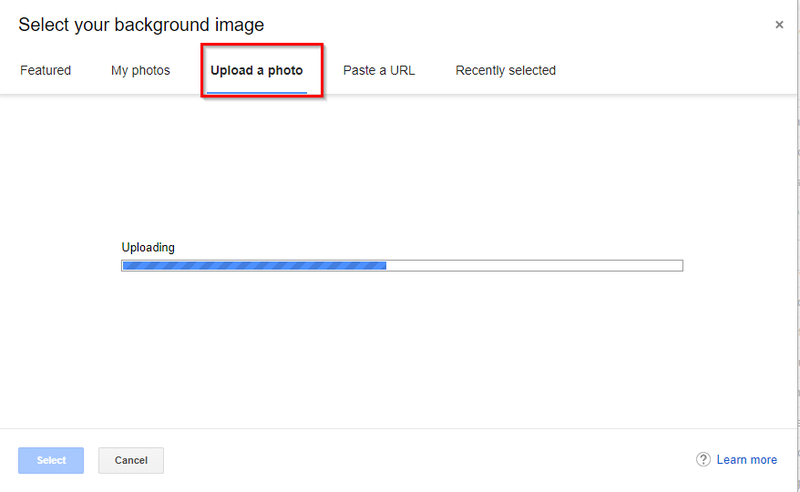 If you want to delete an image you uploaded to set in the background or even a previous template/image then you can do it by simply clicking the delete icon which will appear only when you hover over the image. You can also use plane background which has only colors in it, such as red, green, blue, yellow and others. If you want to set your Gmail background as default then simply find the theme name Light which is the default theme here and set that to apply default background changes.